Apis Mellifera, also known as the European honeybee, or more simply as the “honeybee” to most North Americans, is a liminal creature that troubles the boundaries between the “domestic” and the “wild.” The honeybee, on one hand, is intricately bound up in the lives of humans: imported from Europe and “kept” by beekeepers, honeybees are embedded in the human capitalist economy where they have been commodified, exploited, and traded for their labour (as pollinators in orchards, for instance) and for their honey, which is produced by the bees and stored in the hive to weather the cold winter months (Sandilands 2014, 164). Honeybees, on the other hand, cannot be controlled in the same way that other domesticated animals kept for profit can. In order to feed and to forage for the pollen, nectar, and water on which the colony depends, forager honeybees travel from a few hundred metres to up to ten kilometres from the hive (Seeley 1995, 49-50). A point of frustration for organic honey farmers is that they have no control over the forage terrain of their bees. In organic farming, a beekeeper might only have organic flowers, but the bees are likely traveling well beyond human territorial limits in search of food, which frustrates the beekeeper’s attempt to control the bee’s labour. In the late spring and early summer, the beehive does a remarkable thing: it swarms. Since the hive population doubles over the course of the year, there are simply too many bees in the hive. The hive separates, and half of its tenants, including the old queen, collectively leave the beehive and gather on a branch in a cluster where they might remain for days before they select and occupy a new home. A single swarm can have up to 10,000 bees, and so this marks a considerable loss to the beekeeper. Beekeepers generally try and control this process by dividing up their colonies when they are near capacity. However, honeybees have their own highly organized social structure that exists within but apart from our anthropocentric one, and even under domestication, they exercise an incredible amount of agency. Honeybees’ social organization has been compared to, among other things, a democracy (Seeley 2010). Based on his research in the 1940s, entomologist Karl von Frisch discovered that bees have a language of their own, communicated through the “waggle dance”–a wonderful series of twists and turns danced in a figure-eight pattern. The scout bees that forage for food will return to the hive and “debate” with one another through dance about the best location for food (Seeley 2010, 9). During the swarm, the same process occurs, but the debates are about potential locations for the new hive. Once they have agreed on the site, the swarming honeybees, which have a hive mind of their own, move in to their new home, which is most often a tree cavity. Formerly domesticated bees that have escaped the colony in a swarm are described as feral, and only an experienced beekeeper stands a chance in attempting to recuperate the lost swarm. Butterflies and moths, which belong to the order of insects Lepidoptera, have also captivated the attention of entomologists and amateur naturalists, but for different reasons entirely. Since butterfly and moth collecting came in vogue in the 18th century, leisured men and women in North America and Europe have planted gardens to attract butterflies for the mere pleasure of their beauty, while amateur and professional naturalists have captured caterpillars and “raised” them to study their habits and life cycles. Anna Botsford Comstock and her husband John Henry Comstock, celebrated naturalists, were influential leaders in the nature study movement; they provided instructions in their book How to Know the Butterflies (1904) on how to make “breeding cages,” so that children could learn about the metamorphosis of moths and butterflies. Today, “raising” butterflies is not only a leisurely and educational pursuit, it is both motivated by human politics and economics. The monarch butterfly has seen a significant reduction in its population over the past 20 years, particularly in the American Midwest, and the decline is largely attributed to pesticide use and specifically to the application of neonicotinoids in agriculture. 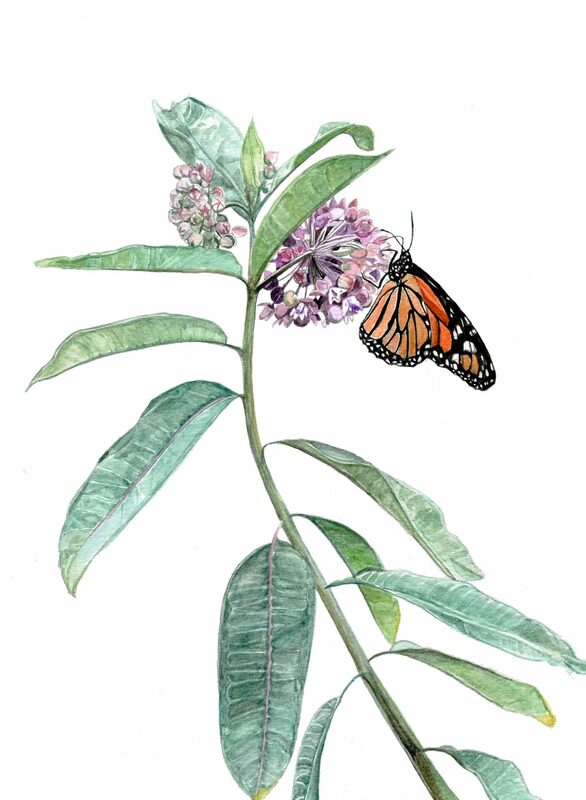 Lobbyists and NGOs have responded by calling to have the worst-offending pesticides banned, while other groups have focused on planting native plants, particularly milkweed, to create “butterfly corridors” as habitat and forage (Suzuki and Hanington 2014; Suzuki and Roberts 2016). Some people view the dwindling monarch population as an economic opportunity. The bodies of monarch butterflies, like those of the honeybees, are commercially produced by “growers” and “farmers” who sell them to customers around the world, often in the name of education and conservation. 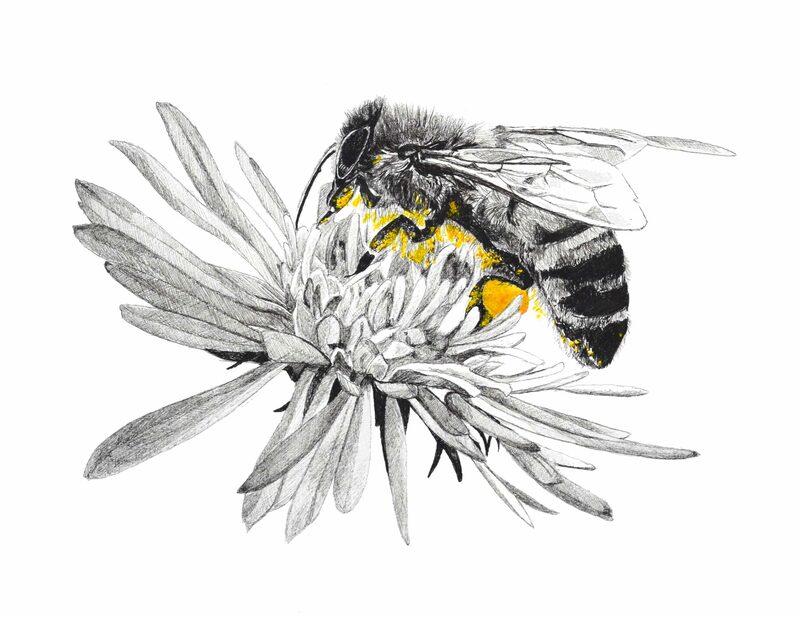 Modern forms of agriculture are decimating pollinator populations in many parts of the world and are threatening human and ecological survival. In some regions of the world, including areas of northern China, hand pollination by humans is replacing the labour of bees, which for 35 million years has helped sustain the complex and interdependent relationships among different plants and animals that together form ecosystems (Imhoof and Hoppenhaus 2014). The precarious situation of natural pollinators at this juncture in global neoliberal capitalism, and the sense of urgency about what could be lost with the extinction of these pollinators, opens an opportunity for us to examine the interdependencies that have been forged between humans and pollinators and, perhaps more importantly, the ethics underlying those relationships. The three pieces included here reflect my interest in exploring the material world of insects—fur, antennae, legs, wings, proboscis, ocelli, mandibles, thorax, leaves, petals, pollen—in high definition. 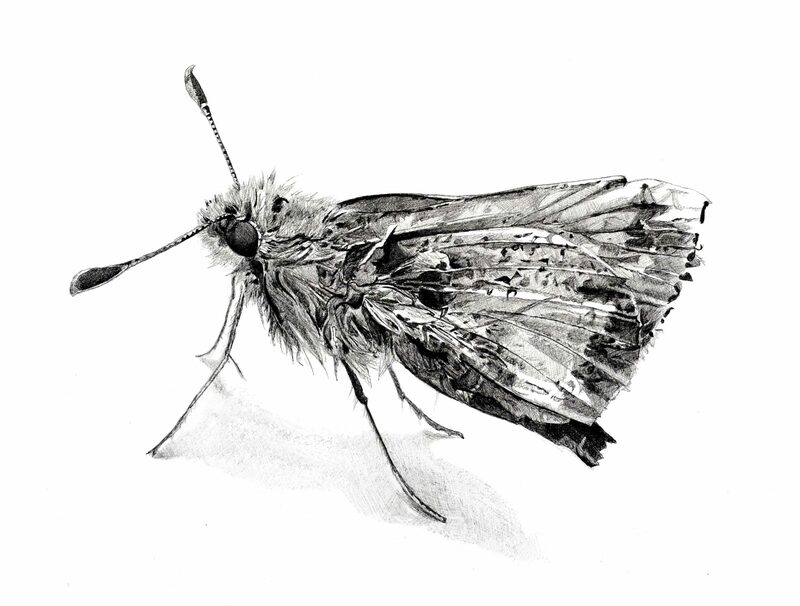 By rendering two of the pieces, Anthophila and Hobomok Skipper, on a larger scale than they are in reality, I make visible the textures and the oddities of the insect body that render them the most interesting, alien, and in some cases, the most abhorred creatures. Comstock, John Henry, and Anna Botsford Comstock. How to Know the Butterflies. New York: D. Appleton and Company, 1904. Imhoof, Markus, and Kerstin Hoppenhaus. More Than Honey. DVD. Directed by Markus Imhoof Switzerland: Mongrel Media, 2012. Sandilands, Catriona. “Pro/Polis: Three Forays into the Political Lives of Bees.” In Material Ecocriticism, edited by Serenella Iovino and Serpril Oppermann, 157-171. Bloomington: Indiana University Press, 2014. Seeley, Thomas D. The Wisdom of the Hive: The Social Physiology of Honey Bee Colonies. Cambridge, Massachusetts: Harvard University Press, 1995. _____. Honeybee Democracy. New Jersey: Princeton University Press, 2010. Leyna Lowe is an award-winning artist and environmental activist. She is active in the Toronto art scene, with her most recent exhibition taking place at the Gladstone Hotel. Leyna is also a PhD Candidate in Gender, Feminist and Women’s Studies at York University where she is writing her dissertation about gender and environmental education for girls. Since she was very young, Leyna has had a natural curiosity for living things, and particularly for birds, which are a recurring theme in her art.